If it was at least good looking, maybe it would be a good machine to have. That all being said I am grateful to have it and it was a thoughtful gift from my parents. Ha ha ha... Not every typewriter was a work of art. And not typewriter has the potential of making a work of art. Sometimes, some things were just made to give us the shits. Can you believe how bad it is though? It's almost hard to read! Well, the reason why this typewriter writes so bad is that (I suppose) these chinese models weren't fine tuned before being sold, but this does not means you can't align it now, to at least make it write in an almost straight line. In my very little typecast I wrote a post about re-aligning types. Sadly, it's written in bad english (I am italian) but you can e-mail me if you need some explanation. I might experiment with it, but it also feels bad, the action is not quality. I might do it anyway just to learn a new skill. Thanks for the suggestion and the info. I have many other machines I prefer to use and I let this one just sit most of the time. Your English seems fine by the way. These are good stories and it's an entertaining post. I got a Generation 3000 a few years ago; I think it was 99¢ on eBay! It's a similar thing, also made in China of course. I noticed that there was no provision for ensuring vertical alignment. That's just bad design. I ended up giving it to a kid who, I hope, has enjoyed it. The most recent incarnation of this design is called the Royal Scrittore. Robert Messenger reviews it in the forthcoming September issue of ETCetera; he found that they've made some improvements and the machine isn't bad. The ad copy for the typewriter is funny, though, because it highlights its flaws as if they were advantages, praising the "nuanced baseline shifts" that give your writing character. If the Chinese put their mind to recreating a really great typewriter design, and put it in a beautifully designed shell, they could create something really cool. The Scrittore looks a little better than mine, but not much! The feel is what I like least, it's just so cheap. I have no doubt the Chinese could make a better machine, maybe if they started out making copies of the SM-9 or 3000 and moved on from there, the same way Toyota and Hyundai learned to make cars. That's a great story too. It's true, you can't ditch your first. I saw that, looks a lot like mine. I agree we should all experience one, but I'd have been happy just typing on a friend's. Now it takes up space but I gotta keep it for sentimental reasons. 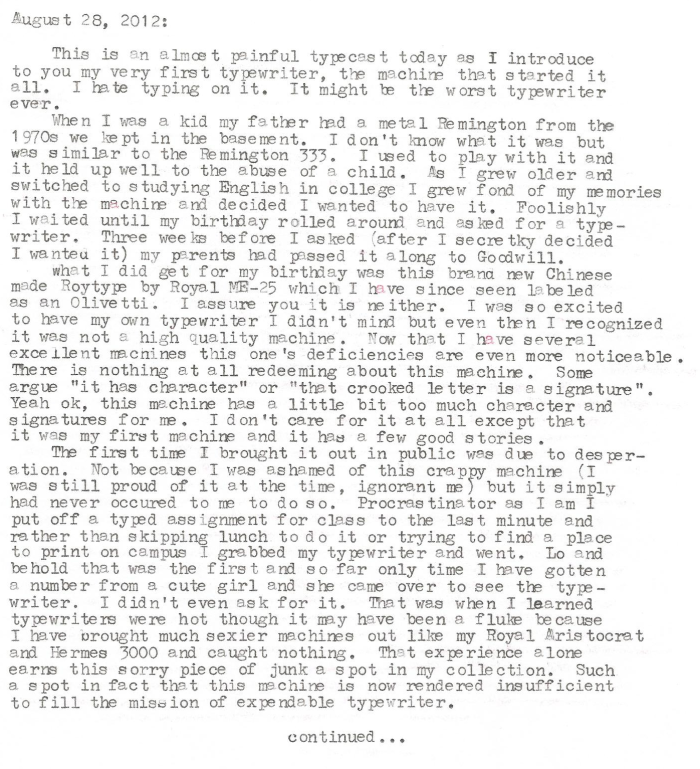 My first typer was actually a Brother word processor, I don't remember the model. It's still at my parents'. Compared with the Remington (or any typer in my collection currently working) I do not miss it. 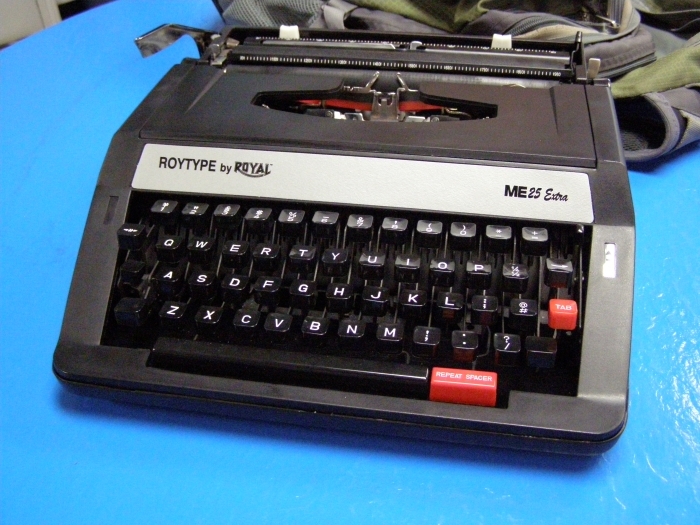 My first 'real' typer is the Royal 5 that still isn't working. A bit off topic, I saw your comment that you're interested in joining the International Correspondence Initiative. Send me and e-mail (my email is linked in that post) and I'll get you started! I think this machine was made to fill catalog orders. It only fills the basic requirements of a typewriter (press key, letter prints on paper, escapement advances, etc.). A typewriter that was made to be be sold through a dealer network would have to have much more precision to sell. I can fully understand that you don't want to part with it because of sentimental reasons. They can't all be winners, unfortunately. I have thought a few times about purchasing one of these newly manufactured machines, but I cannot bring myself to, what with all of the horror stories surrounding them. 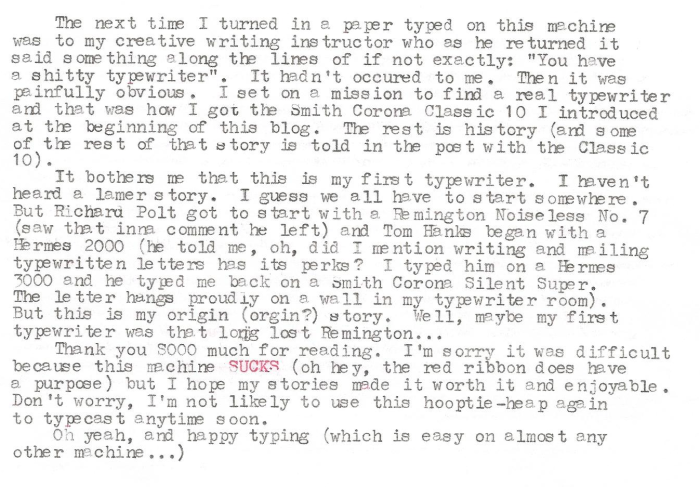 Even still, I love that someone is still producing manual typewriters, even if the quality is lacking. The idea is nice but I promise you the execution is piss-poor. Try and use someone else's and see for yourself before you buy.